TEGUCIGALPA, Honduras (CNN) -- Deposed Honduran President Jose Manuel Zelaya said he was denied permission to land at Tegucigalpa's airport Sunday evening after a deadly clash between Zelaya's supporters and government troops. Zelaya told the Venezuela-based news network Telesur that his jet was denied permission to land in Tegucigalpa, where military vehicles were arrayed on the runway. The aircraft was en route to San Salvador, the capital of neighboring El Salvador, after what Zelaya called a "fruitless" attempt to land. At least one person was killed and eight wounded after security forces opened fire and used tear gas on protesters who ringed Tegucigalpa's airport, said Hugo Orellana, a Red Cross director in Honduras. Protest leaders put the death toll at three. After being denied permission to land in Honduras, Zelaya's plane made a stop to refuel in Nicaragua's capital, Managua. During the stop, he met with Nicaraguan President Daniel Ortega -- who is a leftist ally of both Zelaya and Venezuelan leader Hugo Chavez -- and told Telesur that his supporters had been trying to remove obstacles from the runway in Tegucigalpa when troops opened fire. "The people pulled back when fired upon," he said. In a statement read on national television, the interim government said police opened fire when protesters tried to force their way onto the airport grounds. "The outcome of police intervention has not been verified," the statement said, adding, "The government regrets the consequences of these violent demonstrations." "We call on national and international people who participate in these actions to abstain from encouraging disorder and disquiet of our population not to interfere with our country's development efforts," the statement said. 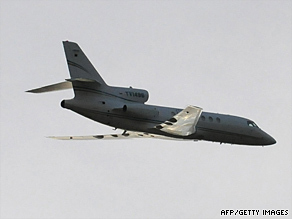 The small jet was transporting Zelaya and United Nations General Assembly President Miguel d'Escoto from Washington. The U.N. General Assembly condemned the coup last week. Zelaya called on the U.N., the Organization of American States and the United States to take action after his return was thwarted Sunday. "What are at risk are social reforms started in Latin America," he told Telesur. "What we see is a return of the right in Latin America -- a more reactionary right, more prone to killing, more fascist than in the past. They're regrouping. It's almost a conspiracy, a plot." At a news conference earlier Sunday, provisional President Roberto Micheletti said that Zelaya's return could create unrest in a country that has seen demonstrators for both sides in the streets since the coup. "I don't want a single drop of blood to be spilled in Honduras," Micheletti said. The leftist Zelaya was ousted in a military-led coup the same day he planned to follow through with a referendum that the courts and the congress had ruled illegal and that the military said it would not support. Lawmakers voted to strip Zelaya of his powers and named Micheletti as provisional president. The provisional government maintains that the military action against Zelaya was backed by a court order and that arrest warrants have been issued against him for violating the constitution. Before his jet reached Tegucigalpa's airspace, Zelaya told Telesur he remained commander-in-chief of the Honduran armed forces and demanded they "to open up the airport and avoid any problems with the landing." A delegation supporting Zelaya, including the head of the OAS and Presidents Cristina Fernandez de Kirchner of Argentina, Rafael Correa of Ecuador and Fernando Lugo of Paraguay, was to fly on a separate plane heading to neighboring El Salvador. In his remarks Sunday, Micheletti extended a diplomatic branch to Chavez and Ortega. The interim leader said his government was open to "good faith" talks with the OAS, but reiterated his government was legitimate and would not be moved. "We are going to remain here until the country becomes calm," he said. In a conference call with journalists, senior U.S. administration officials -- who insisted on anonymity because of diplomatic sensitivities -- said that if Honduras denied Zelaya entry, he would be expected back in Washington on Monday to continue conversations at the OAS. After 18 years of nearly uninterrupted military rule, Honduras returned to civilian control in 1981. Since then, the military has not seemed interested in holding power in the nation of more than 7 million people, about 70 percent of whom live in poverty. Military interventions were once common in Latin America, but civilian governments have held sway since the 1980s. Before Sunday, the only other barracks revolt this decade was an unsuccessful 2002 coup attempt against Chavez, when the military displaced him but backed down days later and allowed his reinstatement. CNN's Karl Penhaul and Charley Keyes contributed to this report.